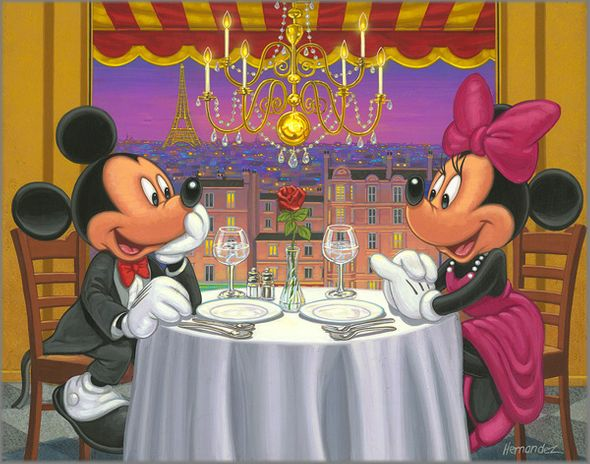 Manuel Hernandez Signed and Numbered Limited Edition Giclée on Canvas:"Dinner for Two"
About the Artist: Brilliantly composed and filled with vibrant color, the paintings of Manuel Hernandez are a feast for the eyes. Reflecting the mastery and energy of some of the finest artists to ever fill the pages of Disney history, Hernandez's work captures the magic and essence of this timeless artistic tradition and moves it reverently into the twenty-first century. Manuel's meticulous attention to detail is the hallmark to his paintings. Traditionally trained, Manuel Hernandez, a Southern California native was originally inspired and influenced by the contemporary illustrative works of J.C. Leyendecker, Dean Cornwell and Norman Rockwell. Having studied and apprenticed as an illustrator, Manuel Hernandez developed his skills with pen and brush to a level of mastery that would come to satisfy even the most discerning eye of some of the more critical Disney art traditionalists. When asked to contribute his artistic interpretation of the Walt Disney legend Hernandez set about to create a fresh perspective utilizing a modern Americana theme made famous by his early illustrative influences. Armed with many years of study and an equally demanding self-drive for perfectionism, Hernandez incorporated the powerful style of Muralist Diego Rivera, which when blended with his illustrative technique helped to create the unique and passionate artwork he would become famous for.